Poor Guy Walks Into Pitbull Territory And Gets Bit Up. Dogs go wild for many reasons and they become furious when something do not go with them. This poor man had to fight with Pitbulls with flip flops, shorts and a water bottle. Dogs do not allow others in their area. It was not clear why the dogs attacked the man. The two dogs started barking when he was little far from them. You can see the shirtless guy with a water bottle in hand comes into view. He was probably out to fetch water, unfortunately, there were angry Pitbulls in the area. 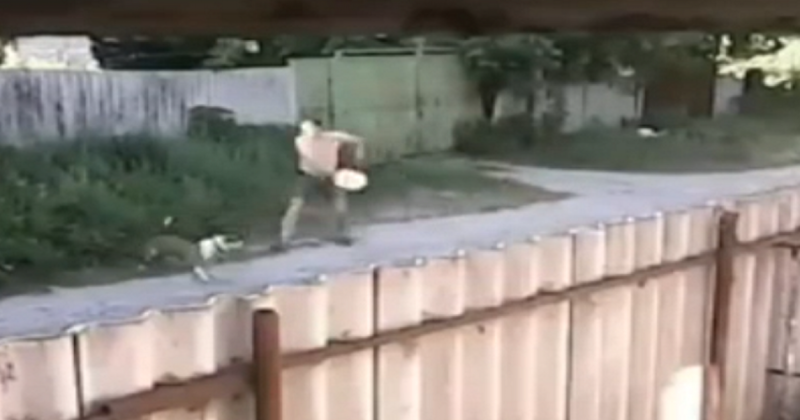 The pitbulls attacked the man furiously that is clear from the footage. From the footage, it is seen the dogs were outside a gate of a house, when they spotted the man, they headed towards him. In panic the man also start to swing his water bottle onto the dogs. It was going well, the dogs weren’t attacking at first. But the moment changes when the poor man fell to the ground. He managed to get up, but that’s when the dogs came at him. He can be seen swatting the dogs with his hand, while he screams in pain or fear. We can’t see what’s happening since view is obscured by fences.